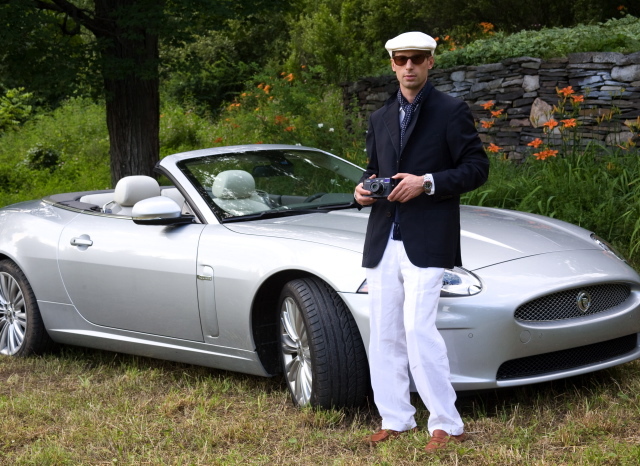 I recently had a chance to take the wicked new 2010 Jaguar XK roadster – 385 hp, 0-60 mph in 5.2 seconds, F1 paddle shifters and all – available this August for a spin and had a bit of fun channeling Steve McQueen (with his D-type, bottom) and Clark Gable (XK-120, below) along the way. While in possession of the ragtop I stopped by a painfully hip art opening on the beautiful Bard College campus – shades of Bennington and VAPA circa 1993 – and checked out the recently-reopened Rhinecliff Hotel for drinks on the bluestone patio by the Hudson River. That’s a Leica M8 I’m holding, in case you were wondering, while sporting a Brooks Brothers driving cap, Paul Smith shades, Tod’s moccasins, Etro jacket, RL linen pants, Turnbull & Asser scarf and the trusty GMT Master II. Perhaps a bit Bertie Wooster but it was fun while it lasted. Check out the whole shoot here. This entry was posted in Cars, Style and tagged convertibles, Jaguar, Jaguar XK, Leica, summer style. Bookmark the permalink.